To ensure prompt crediting to your account, please remember to include your account number on any checks or payments mailed to Great Plains. If you are using a bill pay service to automatically pay your Great Plains bill, make sure your information is has the correct Great Plains customer account number. Your account number is located in the upper right corner of your Great Plains bill. For an explanation of any part of Great Plains bill format, find the description below on that specific section. The larger image shows the front of our bill; the smaller, inset image displays the back of the bill. Here you will find the name listed on the account, as well as the service address, where natural gas is delivered. This area contains your account number, the bill date, the amount due, and the date payment is due. This area provides a summary of your account: your previous balance, previous payment, current balance, total amount due, and the due date of your next payment. Adjustments, if any will also be shown here. Use the information here to contact us, to report an emergency and to get answers to all of your billing and customer service questions. This area gives a detailed listing of natural gas utility service charges, including your consumption, the most recent meter reading, days in the billing cycle and the applicable rate schedule. A separate section will be shown for each service. This graph shows up to a 13 month comparison of your historical natural gas consumption. Return this portion of the bill to Great Plains Natural Gas with your payment. When mailing your payment, please make sure the address on the remittance stub shows through the window on the return envelope. 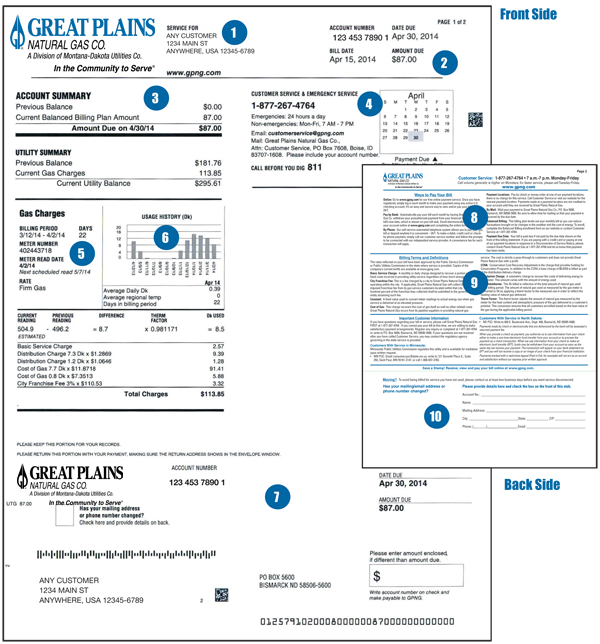 This section provides information about the various bill payment options available to Great Plains Natural Gas customers. Important billing terms and definitions that are useful for understanding your bill can be found in this area. If your contact information has changed, please complete this section and send it to Great Plains Natural Gas with your payment. If you have questions about the bill format, please contact Great Plains Natural Gas at 877-267-4764.